In achieving this, the FFS also aims to increase the level of participation in extracurricular activities for girls and to address the imbalance between male and females participating in Football. As such, FFS continues to provide activities and opportunities through football for girls and females to get involved and take part. The latest addition to achieving is the current National League that runs every Saturday mornings for the under 12 and under 15 girls teams. The tournament has seen eight enthusiastic teams register at Under 12 level and 10 teams at Under 15 level. 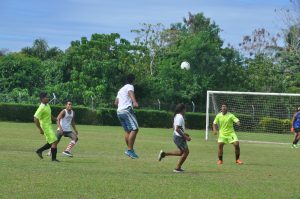 The teams are from the villages of Faatoia, Leauvaa, Vaimoso, Vaitele Uta, Malifa, Apia and Vaoala, Vailele and Siusega. The FFS through support from the FIFA Women’s Development program has provided transport for all the teams participating in the girls youth league by way of special buses which will pick up the teams from their villages each Saturday morning. They will also support the clubs with gear, training opportunities for their coaches and talented players and by conducting regular club visits, where the FFS technical team attend club trainings to offer technical advice and support. FFS CEO Sarai Bareman emphasises the importance of the tournament “The development of Womens football is a strong focus for FFS this year. We are very blessed with the support we receive from FIFA for women’s football and it is vital that we put this support to good use. The tournament for the under 12 and under 15 girls is played at the FFS Complex in Tuanaimato every Saturday morning from 8.30am to midday until the season finishes.